The art of welding has been practiced for more than three thousand years and the skill remains in high demand. According to the Department of Labor Statistics there are more than 400,000 welding jobs currently in the USA with more than 65% of them in manufacturing. Average wages range between about $13 to $20 per hour for median workers. The outlook for welders in manufacturing is stronger than that for other occupations in manufacturing because of the importance and versatility of welding as a manufacturing process. The basic skills of welding are the same across industries, so welders can easily shift from one industry to another. Welders with up to date training and who can demonstrate their skills are in high demand compared with many other industrial skills. 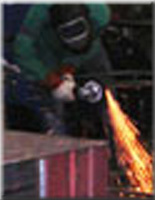 Welders may work indoors or outdoors and are exposed to various hazards. Safety is a high priority and a major part of the welding program at Life Center. This core vocational class is designed to provide students with short-term intensive training emphasizing the most highly demanded skills in the area. Students learn the essentials of several types of welding and cutting operations and shop safety. Students also learn about equipment used in industry, gasses, metals, and tools. Students successfully completing the class are also awarded three Vincennes University credits. This class runs 4-hour per day, Monday to Thursday, for six weeks (96 contact hours). Class size limit: 8. This advanced vocational class prepares students for a specific AWS certification. AWS certification is the industry standard and it is the practical requirement that must be met in order to obtain employment in almost any welding shop. This class runs 4-hour per day, Monday to Thursday, for 4 weeks (64 contact hours). Students must complete the introductory welding course or demonstrate sufficient skills before taking this class. Class size limit: 4. This is the core vocation class for the welding program. Students complete safety training and demonstrate safety skills before being permitted to touch the welding equipment. Students learn MIG flat welding, 3G vertical welding and other types of welding. Students also learn about the gasses, metals, tools, and fabrication equipment associated with welding. This class runs 3-hour per day, Monday to Thursday, through the 8-week term (96 contact hours). Maximum class size is 8.